Your dishwasher’s not working! Maybe it’s time for a new model. Or maybe not. You may just need a replacement part to get fixed up and back on your way. Switches, motors, belts, and even small plastic parts often wear out long before your entire appliance is done, and repairing or replacing these parts is a good way to extend the serviceable life of your appliance. Many homeowners choose to have a qualified repair contractor come out to diagnose problems with appliances and order and install replacement parts to fix them. But with plenty of online resources and direct access to repair parts, homeowners are increasingly finding that some appliance repairs are an easy DIY fix that can save hundreds of dollars. Or, if you prefer to have a pro handle it, consider ordering parts direct to save on the overall cost of service. Repair Clinic: Find parts for any type of appliance on RepairClinic, from your dryer to ice machine. Plus, get repair help with advice for solving common problems and support based on your model number. Easy Appliance Parts: Search by model number to find the right parts for your appliance. This website offers a one year warranty, no hassle returns, and same day shipping with an average delivery time of 1.7 days. Whirlpool Replacement Parts: Find replacement parts for Whirlpool kitchen and laundry appliances on the Whirlpool website. They have filters, accessories, and more for their brand items, along with manuals and support to help you get your parts installed. PartSelect: Get same day shipping on two million parts with 30 day returns on PartSelect. This website features parts for all types of appliances and brands including Frigidaire, GE, LG, Maytag, and more. GE Appliance Parts: Find GE brand touch up paint, replacement parts, cleaners, and more from GE’s parts department online. You can also schedule service, find frequently asked questions, and see troubleshooting tips and videos. Appliance Parts Pros: With more than 2.1 million appliance parts available, you’ll be able to find what you need in stock with quick delivery, a 365 day return policy, and free tech support. You’ll get an illustrated parts list and even breakdown diagrams so you can understand how to install your new parts. Maytag Parts Online: Shop parts for your Maytag refrigerator, dishwasher, garbage disposal, and more on Maytag Parts Online. eReplacementParts: Get the appliance replacement parts you need on eReplacementParts — and get them fast with all in stock parts shipping within 24 hours. You can also get special orders and drop ship items, and find parts repair advice. Amana Replacement Parts: Order replacement parts including door handles, panels, motors, and more for Amana major appliances here online. Black and Decker Parts: Get parts for Black and Decker appliances on ServiceNET. You can also find service FAQs and find service centers if you need help with repairs. Thingiverse 3D Printing Plans: Have access to a 3D printer? Print your own replacement parts with one of Thingiverse’s more than 9,000 plans for printing replacement parts. Bosch Home Appliances Accessories & Parts Store: Check out the Bosch website to see diagrams of your appliance and locate and buy original parts for repair and replacement. Presto Parts and Service: Search for your Presto product to find genuine Presto replacement parts and accessories available online. LG Parts & Accessories: Find parts and accessories for LG products, plus get access to videos and tutorials and a help library. You can also schedule repair service if a DIY parts replacement isn’t working out for you. Amazon.com: Check out Amazon’s appliance parts department to find more than 130,000 parts and accessories for appliances, many available with next day delivery. eBay Appliance Parts: Check out the eBay online marketplace to find new and used replacement parts for your appliances. Best Buy PartStore: Best Buy has 4 million different parts available for most electronics and appliances. Get free shipping on qualifying orders and take advantage of an easy 30 day return policy. Home Depot Appliance Parts, Filters & Accessories: Check out the Home Depot online to see parts, accessories, and more for your appliances. Many are even available in store for same day pickup. Lowe’s Appliance Parts: Shop for accessories, replacement parts, and more on Lowe’s, plus find guides for appliance repair in their repair center. Sears Parts Direct: Find parts for top brands and models on Sears Parts Direct. You can even set up automatic water and air filter orders to get free shipping. Electrolux Parts: Find replacement light bulbs, filters, and accessories with the Electrolux Parts department online. Kohler Maintenance & Replacement Parts: Shop Kohler’s maintenance and replacement parts to repair and maintain your toilet, faucet, sink, and other Kohler products. Moen Replacement Parts: Use Moen’s troubleshooting guide and customer support to figure out what’s wrong with your faucet or sink, then order your replacement parts directly from Moen online. Appliance Parts: Purchase factory certified parts from Whirlpool, Maytag, Jenn-Air, and more from Appliance Parts online. Find your parts by appliance model, search by appliance type, or browse by category. You can also get help locating your model if needed. Ready to replace your own appliance parts? Be sure you know what you’re doing. 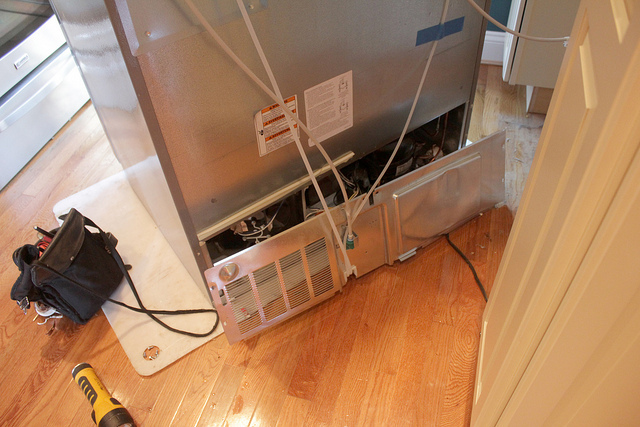 Use these tips to make sure you’re taking care of your appliance repair the right way. Get your diagnosis right: Not sure exactly what’s wrong? You can waste a lot of time ordering and installing parts that have nothing to do with the problem. Look online for diagnostic resources including appliance fault codes so you can accurately figure out what’s wrong and get your repair right the first time. When in doubt, hire a pro: If you’re not confident in your ability to repair your appliance independently, it’s always safer to call a professional. Appliance repairs gone wrong can leave you with a nonworking appliance for days or weeks — and if you’re really unlucky, you might even cause more problems than you had originally. Weigh the cost of professional repair with the time and effort needed to DIY: Again, it may be better just to call a pro if you’re not sure. Before deciding to DIY it, take a look at what exactly you’ll need to do in order to complete the repair. If it’s time intensive, extremely difficult, or requires expensive tools you’ll need to buy or rent, tally up the true cost of the repair vs. how much you’d pay a professional. Order from reputable dealers only: Many manufacturers offer parts direct as well as from dealers. When shopping online, it may be difficult to be sure that you’re buying from an authorized dealer. Look for seals of approval, good return policies, and when you get the parts, be sure they have the brand name on them. Take advantage of online resources: Most parts dealers and manufacturers offer resources for DIY installation of replacement parts, including diagrams, repair manuals, and even online how to guides. When you buy your parts, be sure to find out if these are available. If not, search online using your appliance’s model number. Great resources include The Family Handyman and online appliance repair glossaries. Ready to repair your own appliances? With the right knowledge, parts, and a little elbow grease, it’s possible. With the resources we’ve shared, you’ll be well on your way to a fast, easy repair. Is your appliance beyond repair? Learn the difference between appliance insurance and home warranty to figure out if your repair job or replacement costs are covered.